Reasons lock was not written anywhere. Yes. There was one VPS sent one abuse was closed on the same day. The hosting of an abusive content (Phishing) on ​​your VPS vps100062 [.] Vps [.] 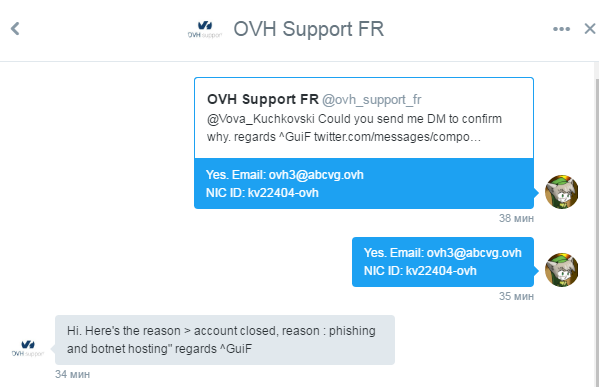 Ovh [.] Ca has been reported to or noticed by our Abuse Team. — End of the technical details — Your should investigate and fix this problem, as it constitutes a violation to our terms of service. Please answer to this e-mail indicating which measures you've taken to stop the abusive behaviour. I wrote to you on e-mail: ticket+rzxhdvlqfs.ba86@abuse.ovh.net. Ok, I removed a phishing site. We sell your VPS and server. It is evident that the customer has filled in specially phishing site. I reinstall the OS VPS. And he wrote a client that he broke the rules. You abuse for one-on-one custom block all at once an account? Together with domains? 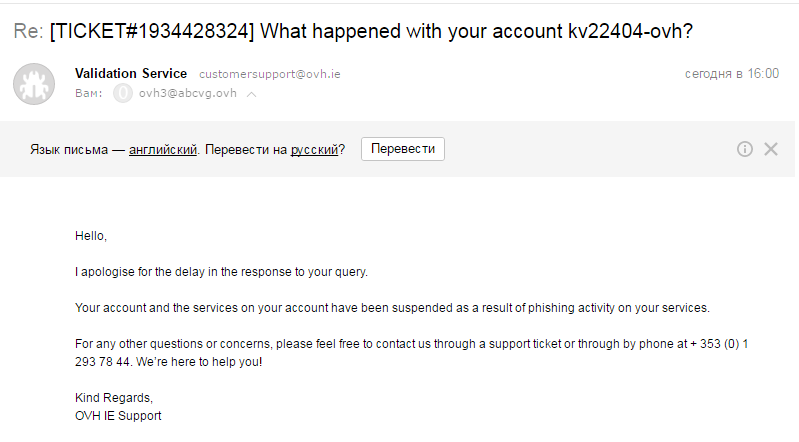 And today (21.11.2016) I got a lock kv22404-ovh account for phishing. Then the question of what kind of phishing? If the VPS problem has been reinstalled on the same day when I came to the complaint. Why block the whole account, not individually specific VPS? I even created a website your DC: ABCVG.ovh. It's like a slap in the face. I've lost confidence in you. Просто не пиши по-английски. Или используй гугл транслейт - там явно выше уровень. Ну я не вчитывался в грамматику. Писалось на скорую руку. Это же для них написал и им ссылки поскидывал. Ответов нет. Просто игнорят и все. Вообще не верится что виноват такой домен, так как тот домен был зарегистрирован 8 числа. А на домене ничего не было и не был прикреплен даже к cloudflare, только NS указаны. Три тестовых домена были взяты чтобы проверить как долго будет платеж идти. Не понял к чему был комментарий. Здесь суть в том, что бан был за закрытую абузу.